My book is written, and the process of finding the best publisher is underway. Rebirth is the story of my personal journey around the world on the world’s largest motorcycle. In late 2016, the company that Sue and I ran for 28 years went in to administration. Eleven days after that, following a long fight with cancer, she died. I set off from London to attract attention, deliver messages to the world, and share passions. I asked the world to deliver something to me in return, but in my wildest dreams I could not have imagined how it would turn out. People, places, sights, sounds and smells filled every day with joy. Unmade roads, breakdowns, border crossings, guns, machetes, sweat and tears, as well as illegally entering the USA, formed part of the daily challenges. But an improbable meeting, an impossible continuation, and utterly unpredictable conclusion took me from heartbreak to happiness. It led me to re-learn what I already knew to be true, that the greatest thing in life is to learn to love and be loved in return. My thanks go to others who have ridden and written before me, including Ted Simon, Jim Rogers, Sam Manicom, Charley Boorman, Lois Pryce and more. 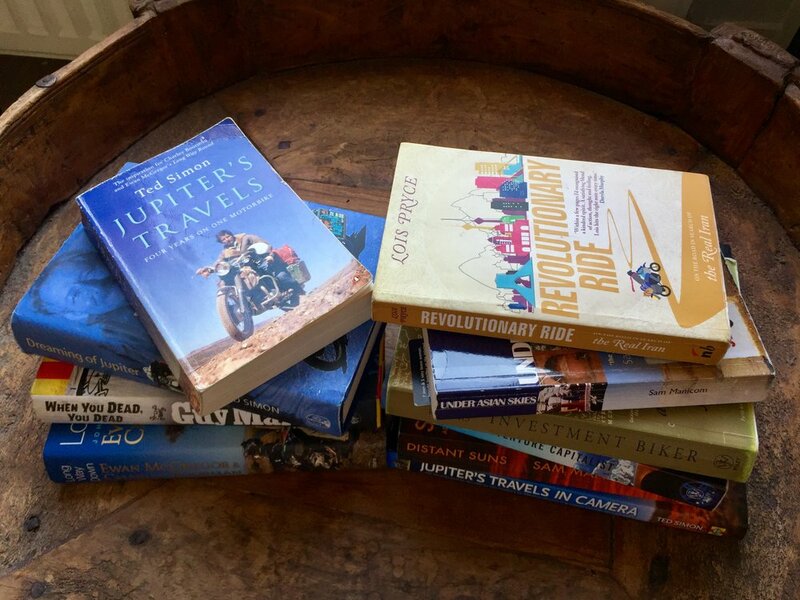 A selection of some of the adventure books I have loved.